If you think you know what accordion music sounds like, hold onto your hat! Motion Trio — Janusz Wojtarowicz, Pawel Baranek, and Marcin Galazyn — is a group of Polish accordion players who take their music to places it has never gone before. 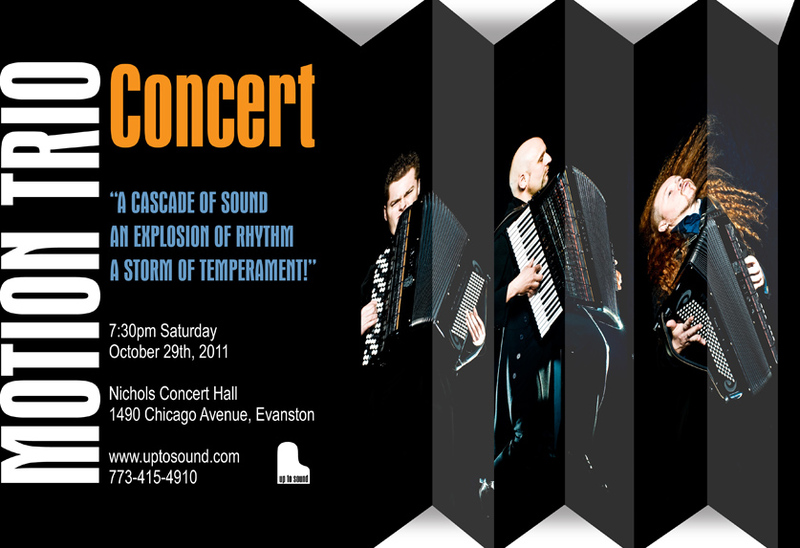 Motion Trio was in the Chicago area Saturday Oct. 29, 2011 for one concert at Nichols Hall in Evanston. The group played some of the music that has made it an international sensation. Both individually and as a group, the classically trained musicians of Motion Trio have won a clutch of awards for excellence in playing their instrument, which is often associated in the public mind with folk music and street performers. Playing custom-built, extended-range Piginis — "the Rolls-Royce of accordions," according to Wojtarowicz, the group's leader — Motion Trio is determined to expand that perception. Motion Trio was tapped to perform last year at a festival devoted to the music of Frederick Chopin in Nantes. The group has interpreted the music of other Polish composers as well, including Henryk Mikolaj Gorecki and Wojciech Kilar. The British composer Michael Nyman collaborated with the group on an album, "Acoustic Accordions," and the members of Motion Trio also compose their own music. “Using our imagination and sense of humor, we work to create a new sound,” says Wojtarowicz of the group he founded 15 years ago. “We don’t use any electronic effects, just the pure acoustic accordion's sound." World class accordionists, who using all the advantages of the accordion, continually explore the new possibilities of this instrument, changing the way it is perceived. Not a folklore, not a tango, but music in ironic style, of innovative tone, a fusion of rock, jazz, classical, and techno, on accordions often changed into bongo drums. Winners of many prestigious awards, invited to play at world's best concert halls on six continents, in thirty three countries, Motion Trio finds inspirations for their creations playing on the streets. Their concerts are musical performances full of passion, action and drama. Highly energetic and vigorous - the three virtuosos easily draw their audience into the electrifying, fascinating show.